Spearmint oil is an aromatic substance extracted from the leaves and flowers of the spearmint herb. Spearmint oil is extracted by using the steam distillation method. Spearmint oil is often used in food and beverages in order to impart a minty flavor to confectionaries, chewing gums, beverages, sweets, desserts, ice creams, etc. Spearmint oil shows great application in personal care products such as toothpastes, mouth fresheners, mouthwashes, perfumes, deodorants, and cosmetics. Spearmint oil is also used in therapeutics for its analgesic and antimicrobial properties. Spearmint oil is often used in aromatherapy in order to cope with problems such as migraines, headaches, fatigue, and digestive problems. Spearmint oil is a natural stress reliever, and hence, is used in aromatherapy for uplifting the mood, relax the body, and to ease the feeling of nervousness as well as stress. The global spearmint oil market is expected to show an incremental opportunity of US$ 123.5 Mn by 2027 over 2018. In the global spearmint oil market, the organic segment, by nature, is anticipated to experience the highest CAGR of 8.4%. North America holds the largest share in terms of value in the global spearmint oil market. Europe has a lesser market share because it is a mature market. Among the global spearmint oil market's nature segments, the conventional segment is expected to dominate in terms of volume, due to its lower price as well as easy accessibility in various regions across the globe. The preference for the organic segment is growing in developed as well as developing countries, along with the on-going organic trend and increasing spending capacity of consumers. The organic segment is expected to experience robust growth during the forecast period. By end use, the aromatherapy and therapeutics and food & beverage segments are expected to exhibited high growth in the terms of volume and value, respectively. The increasing popularity of aromatherapy and the growing demand for natural additives in food and beverages attributes to the growth of these segments. The use of spearmint oil in personal care as well as home care products is also expected to increase during the forecast period. Increasing health issues due to use of products with artificial additives has led to an increase in the awareness among consumers about the advantages of the use of natural and organic ingredients such as spearmint oil in food as well as personal and home care products. Spearmint oil has carvone, 1, 8-cineole, limonene, and β-myrcene as its primary constituents. These chemicals are known to have a highly beneficial effect on a person’s mental and physical health, and hence, spearmint oil finds many applications in aromatherapy and therapeutics. The rising awareness about the health benefits of spearmint oil proves to be one of the most prominent drivers for the growth of the spearmint oil market during the forecast period. Owing to the benefits of spearmint oil, many manufacturers of cosmetics and personal care products tend to incorporate spearmint oil in various products such as skin moisturizers and lotions. The minty and refreshing flavor of spearmint oil allows it to be used in a huge way in oral care products such as toothpastes, mouthwashes, and chewing gums. There has been an increase in the instances of the outbreak of diseases such as dengue and zika virus, which are mainly spread by mosquitoes. Spearmint oil is a well-known insect repellent, and hence, has attracted the manufacturers of insect repellent creams and formulations. The pet industry is growing, and so is the demand for various pet care products. Spearmint oil is making its way in pet care products as a natural alternative due to its various beneficial effects. Spearmint oil is used to treat various digestive issues, help in metabolism, and treat bad breath problems in dogs and cats. The erratic supply of raw materials, i.e. spearmint for production; low awareness about the benefits of spearmint oil, especially in underdeveloped countries and untapped markets; the presence of substitutes in the market are some of the factors that are restraining the growth of the spearmint oil market. By region, the global spearmint oil is segmented as North America, Latin America, Europe, Asia Pacific, and Latin America. North America is expected to dominate the global spearmint oil market during the forecast period. 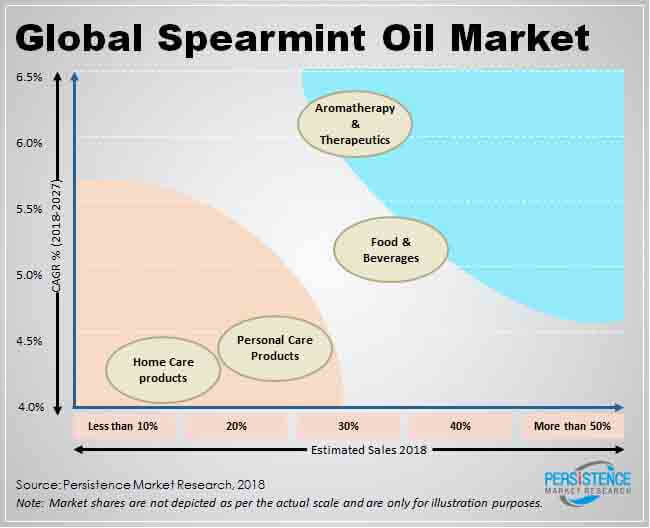 Europe and Asia Pacific follow North America in the global spearmint oil market, owing to the increasing prominence of aromatherapy and the high demand for personal and home care products. North America and Europe are anticipated to grow with high CAGRs in the spearmint oil market over the forecast period. Asia Pacific and Latin America are running close to Europe and North America, owing to the high number of developing countries as well as a good customer base in both regions. Owing to all these factors, the global spearmint oil market is expected to grow positively in terms of volume and value over the forecast period.